WARNING! Please pass a luck test on 2D6 to view the rest of this page. The Warlock of Firetop Mountain is a single player adventure game book created by Steve Jackson (we are not worthy) and Ian Livingstone (likewise), where you (YES YOU, THE HERO) must take on a perilous quest up said mountain and defeat an evil Warlock, smiting various enemies along the way, opening boxes and spending a lot of your time standing at crossroads. Dice are involved, as is the painstaking task of recording down every movement (if you are a massive loser like me), your equipment, skill, stamina, luck (which are all predetermined by dice rolls) and what potion you will take and inevitably forget to use. This was a nostalgia trip more than anything else. Having ‘read’ (or should that be played?) both Portal of Evil and Deathtrap Dungeon by Messrs Livingstone and Jackson back when I was 13, experiencing the giddy heights of dice-rolls, scribbling down stats and breathing a sigh of relief when I manage to roll under 5 on 2D6 took me back. Like all wistful reminiscing, it wasn’t without its “oh god, not that...” aspect. For one thing, I spent a good portion of my “journey” lost in a maze of corridors somewhere in the middle of the book. The amount of times I dodged between pages 52, to 308 to 117 back to the crossroads before being chased by a Goblin meant the book saw itself take flight across my room in frustration. This was my own stupidity, not the books fault - it couldn't change the way it was written. The only thing that could be changed was what pathway I took and unfortunately I had the habit of wandering around like Stevie Wonder on a LARPing weekend. When it came to actual combat though, the thrill of matching my character (in the first case, Staff Sergeant Max Fightmaster) against a couple of Orcs was met with a fist-pump of joy. My many years of wargaming, (not that it came in handy, as dice rolls are, after all, all down to luck); but my passion for it, was rekindled and meant that the breaks in the text (such as it was) didn’t bother me in the slightest. The writing is fairly simplistic and straightforward descriptions of your surroundings and the foes are given, with pictorial aids scattered about. There is no need for complex depth, as this is supposed to be a game; the need for long passages of text is negated and instead replaced by curt descriptions and orders that you, the adventurer must undertake. It almost felt like an instruction manual (with half the pages missing or in the wrong order) to being a big damn hero. Another thing to consider with a Fighting Fantasy book is control and also the lack thereof. In some ways, both are present when you start up the quest – the decision is yours whether to go North or South, East or West, run at the old man waving your sword like LLLLEEERROOOYYY JJJJEEENNNKKIINNNSSSS or drink mead with some dwarfs. But the dice rolls then take over, eliminating your control, putting you in the hands of fate – and in battle, fate is all you’ve got to hold on to really to defeat the various pitfalls, monsters and pass those dreaded luck tests. Did I enjoy the book? I was frustrated by it in some parts, but genuinely found it a fun read in others. I never got the warlock’s treasure however (despite attempting 2 playthroughs), due to failure to get all 3 keys and apparently hitting the chest with my sword wasn’t a good idea. I managed to find a map online after my playthroughs and it seems heading East was the best plan (never fought the Bronze Cyclops, which would appear to have been why I failed miserably). Notes - defeated 2 Orcs, 4 Zombies, 2 Goblins, 1 Minotaur, 1 Troll and the Warlock. Failed to acquire gold due to only having 1 of the correct keys. Also, suffered a hand injury that hampered most of the quest but eventually healed once I remembered the skill potion. Notes - defeated 1 snake, 2 Orcs, 1 Orc chief, his servant, 1 Sandworm, 4 Zombies, 1 Minotaur and the Warlock (after drinking the invisibility potion) Received a pointless glove in the process and lost a lot of stamina. Failed to acquire gold due to only having 2 of the correct keys. Also found out that "Use sword with chest" doesn't work and leaves you with no sword. The nerdery levels of the 1980s were high. In the 1960s, and for a long period in the 1970s, Lord of The Rings had carved a massive swathe through popular culture. This wasn’t the same swathe that the movies would carve in the 2000s; instead, people read the books, devoting a huge period of time and mental energy to imagining – for themselves – Tolkien’s world. Some people did it because it was the done thing. Some people did it because they were massive nerds who wanted to live in Middle Earth. And, I suppose, some people just wanted to read a good story (although I won’t get into the literary merits of LotR at this time). But if you ever wonder why Tolkien’s world of Middle Earth is a sort of ur-myth for fantasy, it’s because we live in a time when the nerdy kids of the sixties and seventies have worked hard, created art inspired by Tolkien, and in turn inspired others. 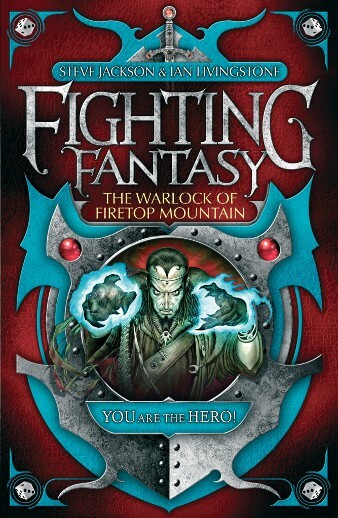 The range of Fighting Fantasy books is one instance of that inspiration. It’s authors were steeped in the subculture of roleplaying games, where nerdy individuals acted out fantastic stories. Contemporary roleplaying has been co-opted by the computer industry, but in the pre-internet eighties roleplaying was about meeting with some equally nerdy friends, rolling some dice, and acting out a story co-operatively. What made the Fighting Fantasy books (and their American Cousin, the Choose Your Own Adventure series) such a hit was that they made the roleplaying experience a solitary one. As computers got better they replaced the need this unwieldy combination of book and game, and instead offered the same experience in an easier-to-consume package. That experience is that of a person who acts. Somebody who does things. In the Warlock of Firetop Mountain, the things you do are an awful lot of killing. Mainly, you are killing the henchmen of the evil warlock. You act decisively and without regret, never thinking about the trail of devastation left behind you. What is lost is twofold; both the original roleplaying experience (perhaps you would befriend the minions of the warlock, and – by play-acting with your friends – convince them to help you, like Frodo convinces Gollum in Lord of the Rings) and the experience of becoming wrapped up in a narrative. This review is, therefore, not a book review. Rather it is a review of a book-like object; it has pages, but you do not turn them one by one, forgetting where you are as a story whisks you away. Instead, you shuttle back and forth between different numbered paragraphs, roll dice, and consider whether going “north” up the corridor is better than going “south”. In truth, it doesn’t matter. Your character is alone in a maze of choices, trying to find that individual path to victory, and if you succeed you have succeeded alone. The experience is so unique that you cannot even discuss it with somebody who has also succeeded in the quest, because they will not have read the same parts of the book as you. You can discuss something similar, but without a joint entry into some other narrative, it isn’t a shared experience. And without that commonality, there is nothing to review.